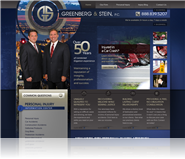 NYC Injury Lawyers - Greenberg & Stein, P.C. At Greenberg & Stein, P.C. their firm is proud to have over 50 years of collective litigation experience. By maintaining a clear reputation of combined integrity, professionalism and success, they have been able to help clients throughout the NYC area who have been struggling with the aftermath of a personal injury. Their firm boasts a member who is a member of both the Million Dollar Advocates Forum®, as well as the Multi-Million Dollar Advocates Forum® – something that less than one percent of attorneys nationwide have earned. They are also proud to have earned an AV® peer review rating from Martindale-Hubbell®, marking them as Preeminent™ – the highest rating available. If you have been injured and would like to discuss your case with an experienced legal professional, you should not hesitate to get the involvement of their lawyers as soon as possible. They proudly make themselves available 24 hours a day, 7 days a week. If you are injured, they can schedule to come to you – no matter whether you are in the hospital or at home. They are compassionate to how difficult the time following an injury can be and are dedicated to making it as painless of a process as possible. No matter whether you were injured in a construction accident while working on the job, were victimized in a car crash or if you suffered from a defective product, you can find the committed advocacy that you need from their firm. They are dedicated to providing high-quality and reliable legal service and will do everything that they can to help their clients seek the just compensation they deserve. Their firm is also proud to provide legal services in Spanish. So don't waste another moment. If you have suffered an injury in New York City, you should not hesitate to contact them today.